This is a static provider that downloads daily historical market sentiment data gracefully provided for free by Unicorn Resarch corporation. At least one symbol should be selected before creating a DataSet. 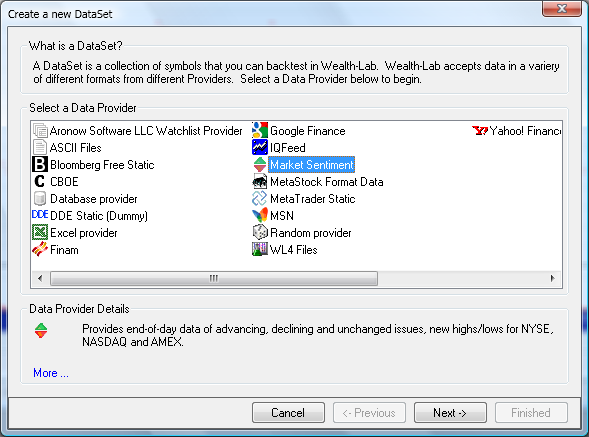 Note that the symbol names are fixed and can not be changed. The DataSet composition can't be changed after creation; if you want to modify it, simply create a new one and delete the old one. Updates are available after 16:45 Pacific time. Until late 2009, Unicorn volume data was capped at 2,147,483,647 (integer number limit). 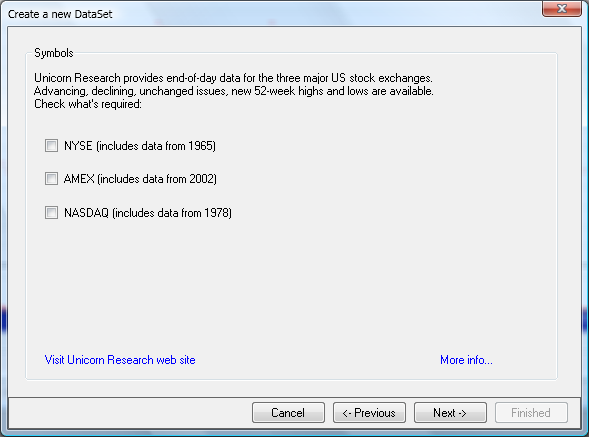 This is an issue with Unicorn data and not with the Market Sentiment data provider. If you haven't downloaded market sentiment data before or your DataSet was updated 5 days ago or earlier, the provider will download the complete historical data. Otherwise, only the available updates will be downloaded to minimize bandwidth and increase the update speed.